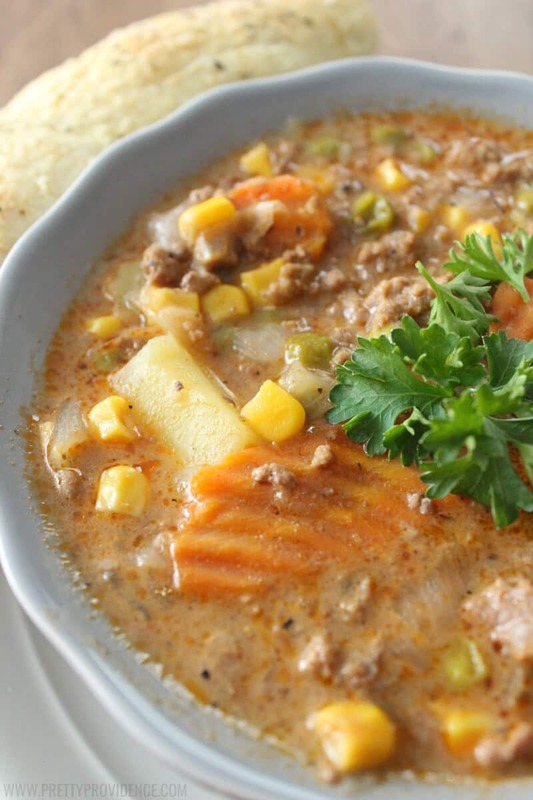 During these cold winter months my crock-pot is literally a dinner saver. The evenings really do feel shorter with it getting dark so early and nothing starts my day off on the right track like having dinner in the crock-pot first thing in the morning! Not to mention, who doesn’t love the smell of comfort food in the kitchen after a long day? 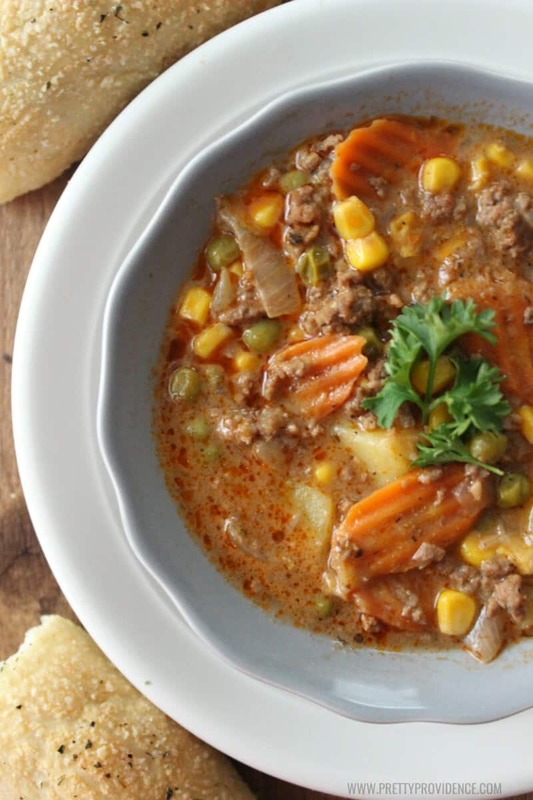 I love this easy beef stew because not only is it hearty and flavorful but it is chock-full of veggies and pretty guilt free! It has become a staple at our house lately and I know you will love it! Cook hamburger with onion and garlic until onion is soft and meat is cooked through, about 8 minutes. Drain excess grease. Add mushroom soup, vegetable broth, vegetable juice, and Worcestershire sauce to crock-pot and stir to combine. Drain hamburger mixture and add to crock-pot. Stir in potatoes, corn, peas, carrots, celery flakes, salt, pepper, marjoram and thyme. Cook on low for 8 hours or on high for 4 hours. When finished sauce should be thickened and vegetables cooked through. 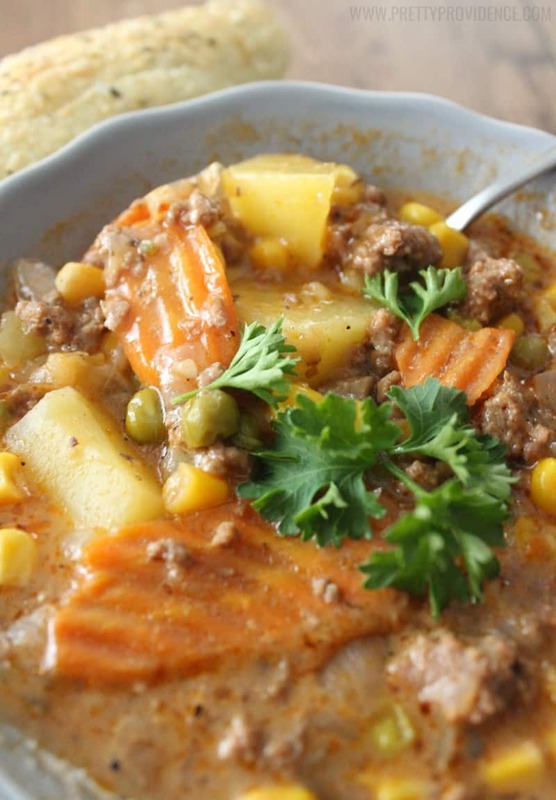 The best thing about this stew is that it tastes even better the next day! Serve with warm bread or a green salad. 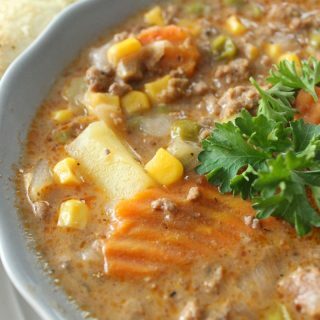 If you liked this post you will probably love our easy slow cooker polynesian chicken or our creamy and healthy potato soup.